Can you believe it’s November already? That’s right…Thanksgiving is just around the corner! Of course, we look for any reason to celebrate at Now Jade Riviera Cancun and Thanksgiving is no different. Guests visiting us over this American holiday can expect all of the traditional Thanksgiving fixings, along with some fun activities and events to celebrate the occasion. 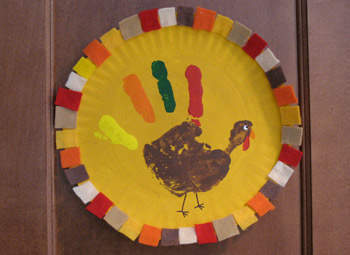 We especially love doing Thanksgiving arts and crafts with the kids in our Explorer’s Club. If you’re looking for a fun and easy way to keep your children occupied, here are the directions for one of our favorite fall crafts at Now Jade! Paint entire plate with goldenrod color and set aside to dry. Meanwhile, cut felt into 1″ pieces. Use several fall colors, such as red, brown, orange, tan, gold and cream. Have all of your paint colors handy and a separate paintbrush for each color. Paint the child’s palm and thumb with a generous amount of brown paint. Have child gently place their handprint in the center of the paper plate. Gently press down on the child’s hand and each individual finger to ensure a good distribution of paint. Have child lift hand directly up into the air so as not to smear any of the colors. Use a paintbrush to add a red gobbler and an orange beak. While the paint is drying you can glue on the pieces for the frame. Pipe glue around the outside edge of the plate and press the felt squares onto the glue, overlapping the outside of the plate. Alternate the colors to create a pattern. Use black marker to draw legs and feet. Use the handle end of a small paintbrush to add a dot for the eye, let dry. Once dry, use a toothpick to dot on the black. Don’t forget to have the child sign and date their creation! Here’s a sample of what it should look like below! This entry was posted in Now Jade Riviera Cancun and tagged arts and crafts, children’s activities, Explorer’s Club, fall activities, fun crafts, holiday crafts, resort activities, Thanksgiving. Bookmark the permalink. fast becoming the key weight-loss supplement in virtually every area. What we appreciate concerning this brand is the reality it’s distributed from this kind of well known retailer. do exactly as taught. The formulation reduces your hunger cravings by halting your hunger that can help you eat less. Even if it will help digestion that will be an excellent advantage. weight loss. Reviews on weight loss supplements that work! extract by hitting the link at the top of the article, below the movie, in the event the order form loads. Yac-o-Electricity will be the most concentrated 100% pure pile-expanded Peruvian yacon root syrup available. next to my personal favorite technique. Encouraging. I do not find it super sweet, however it features a molasses quality. than what most adverts disclose (the product is mostly employed like a weight loss aid). prefer to consume a spoonful of the material pure. The final syrup is strained and flash pastuerized at 80 C / 176 M before bottling. accompanied by another together with your main meal. However the benefits of using Yacon Syrup don’t stop here. of your weight and buy your chance -free trial container TODAY! help increase your weight loss experience.